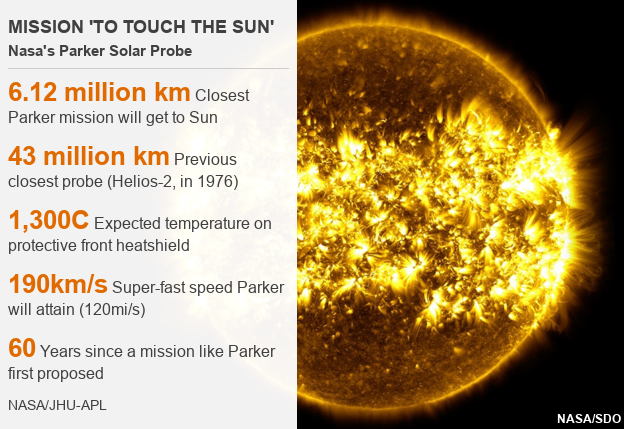 The mission scientists estimate that the probe will get to within 15 million miles of the Sun’s surface by early November, penetrating its corona, or atmosphere. Sometime in 2024, during the last of its 24 orbits around the Sun, the satellite will get to within 3.83 million miles of its surface, closer than any previous spacecraft dispatched to study the star. 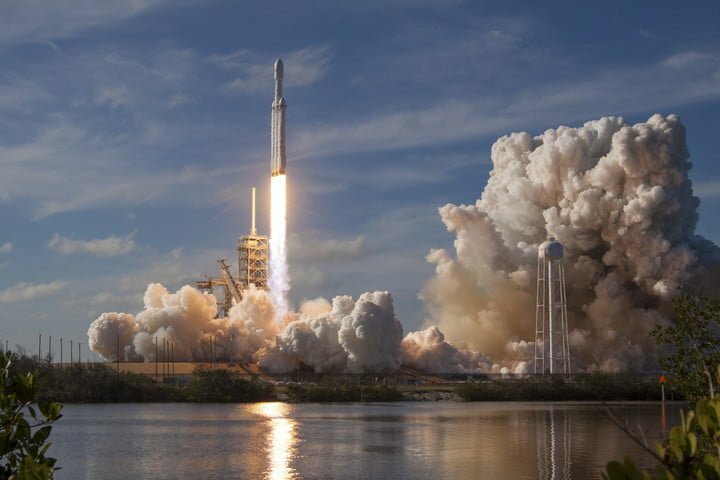 Thanks to the momentum gained from the previous orbits, it will also be dashing around the star at speeds of up to 430,000 miles per hour — fast enough to cover the 139-mile distance between Philadelphia and Washington, D.C. in one second! 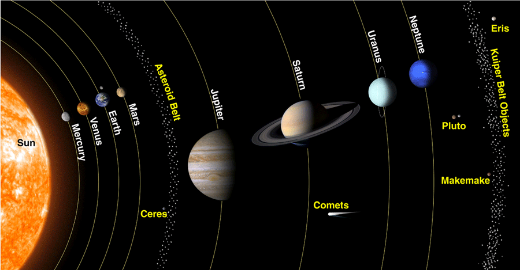 The probe’s sophisticated instruments will collect the same measurements, albeit at different depths, of the Sun’s corona during every orbit. "It's all exactly the same observations; the beauty of the Parker Solar Probe mission is that we are getting [the same data from] these different locations," project scientist Nicola Fox told Space.com. "We really do get a chance to look at the dynamics in all different locations in the corona." The researchers believe the information the probe collects will enable them to find out how the corona achieves temperatures of as high as 27 million degrees Fahrenheit. They also hope to get insight into the reason for the occurrence of solar winds and solar flares, both of which can severely impact space travel, satellites and, if strong enough, even life on Earth. An added bonus would be some insight into Venus. 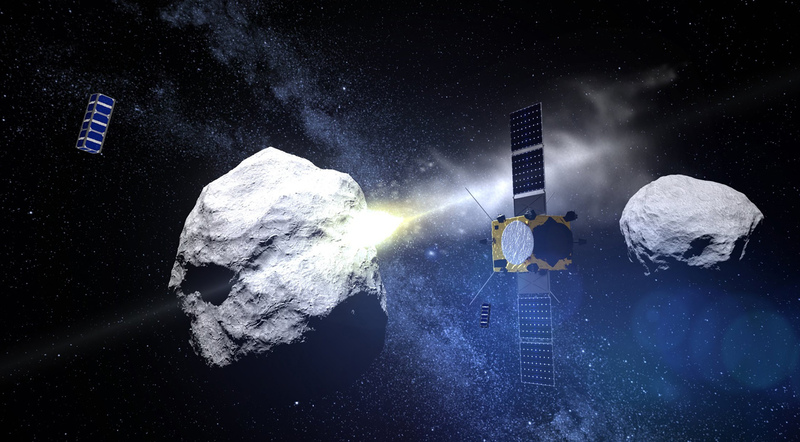 Fox and her team believe this could happen during the probe’s sixth gravity assist around the planet when it will not be aligned with Earth to send data home. 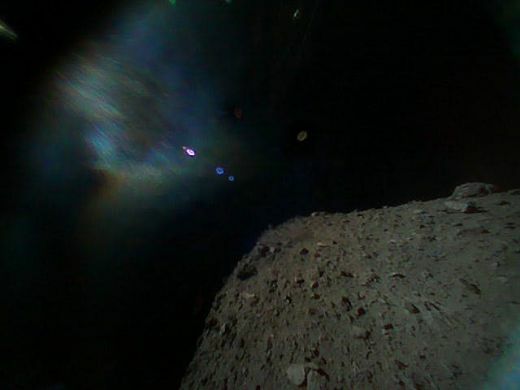 They hope that the instruments will instead record information about our closest neighbor. The Parker Space Probe will most likely run out of fuel in mid-2025, shortly after the 24th orbit around the Sun and eventually disintegrate. The ultimate success of the $1.5 billion mission, humanity's first-ever attempt into the Sun’s corona, depends on whether the heat shield can keep the temperature-sensitive instruments on board the spacecraft at a comfortable 85 degrees Fahrenheit (30 degrees Celsius). While NASA scientists are confident of its ability to protect the delicate instruments, even mild exposure to the extreme heat could incinerate the equipment. The launch of the historic mission comes on the heels of the release of an audio file (above) of the Sun’s atmosphere on July 25, 2018. Called “The Sounds of the Sun,” it is a compilation of 20 years of recordings of the vibrations of the waves, loops, and eruptions from the Sun’s corona, collected by the European Space Agency and NASA’s Solar and Heliospheric Observatory. 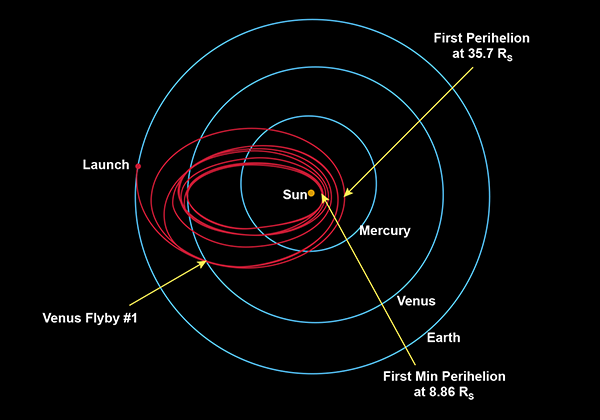 Where is the Parker Solar Probe heading to? Why will the probe fly by Venus seven times? "We really do get a chance to look at the dynamics in all different locations in the corona." I cant believe it went that fast !! Sarah Benton Feitlinger. “NASA's Parker Solar Probe Begins Historic Voyage To "Touch" The Sun.” DOGOnews, DOGO Media, Inc., 22 Aug, 2018, www.dogonews.com/2018/8/22/nasas-parker-solar-probe-begins-historic-voyage-to-touch-the-sun. Accessed 24 Apr. 2019. Feitlinger, Sarah. 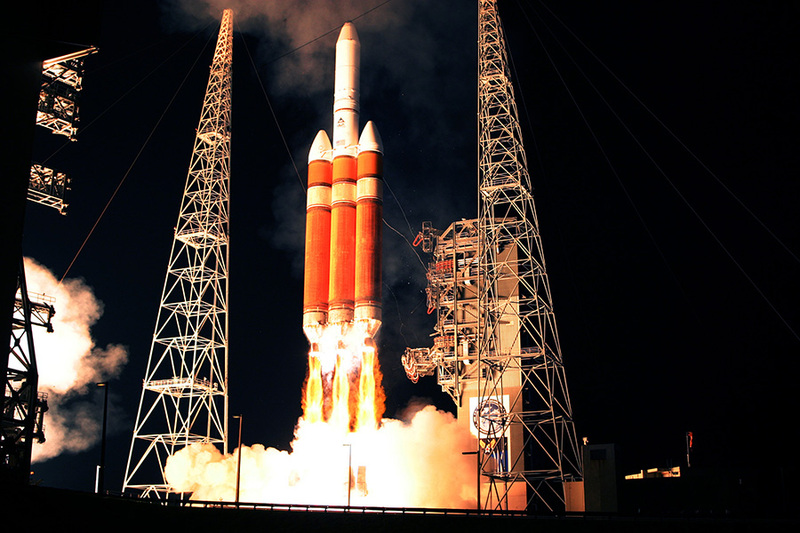 “NASA's Parker Solar Probe Begins Historic Voyage To "Touch" The Sun.” DOGOnews, DOGO Media, Inc., 22 Aug, 2018, Web. 24 Apr. 2019. Feitlinger, Sarah. “NASA's Parker Solar Probe Begins Historic Voyage To "Touch" The Sun.” DOGOnews. August 22, 2018. 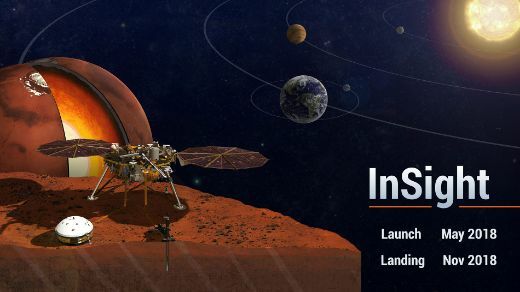 Accessed April 24, 2019. https://www.dogonews.com/2018/8/22/nasas-parker-solar-probe-begins-historic-voyage-to-touch-the-sun.